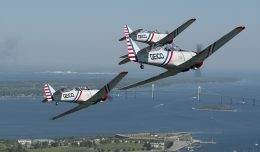 As thousands of spectators looked up towards the skies over Jones Beach State Park on Memorial Day Weekend, few had any idea about both the pre-airshow festivities and the behind the scenes activities that take place during the show. 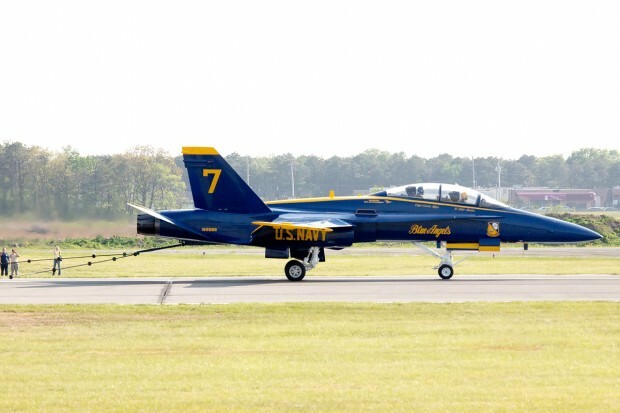 It all starts on the Wednesday before the show, when Blue Angel Seven arrives at Republic Airport (FRG) in Farmingdale, NY. The number seven jet is the narrator’s aircraft and is a two seat D-model of the F-18 Hornet. On arrival, the narrator’s first job is to test the arresting gear set up at the end of Runway 32. The arresting cable works just like it would on an aircraft carrier, allowing the fighter to stop in just hundreds of feet. 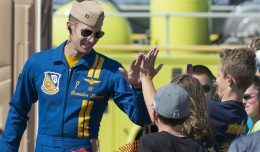 It is put in public lace as a backup system in case a mechanical failure were to prevent on of the team’s F-18C/Ds from land and stopping normally. To test it, they hook the Hornet’s tailhook to one of the cables, release the brakes, and throttle up the engines to full power. Fortunately, the arresting gear went unused during the show weekend. Thursday is the “busy day” for pre-show activities. At around six in the morning, cars can be seen lining up along the fence line. Inside are folks waiting to catch a glimpse of the iconic Blue Angels, the Navy’s flight demonstration squadron, as they arrive into Republic Airport. Following the Blues’ arrival, their bags are unpacked and media interviews are conducted as the jets are prepped for the busy weekend. 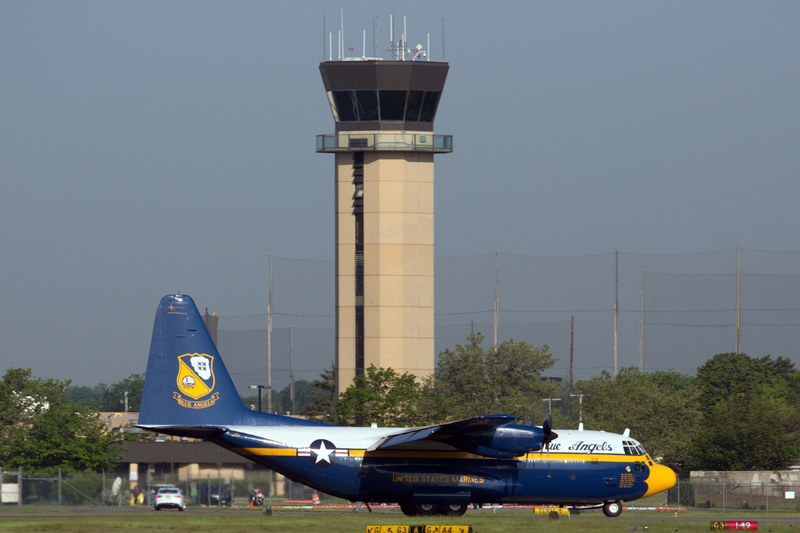 Fat Albert rolls past Republic Airport’s control tower. Many other events take place on the Thursday before the show. 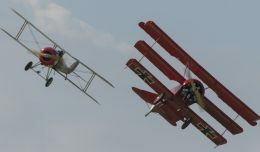 These include school trips to view some of the performing aircraft. 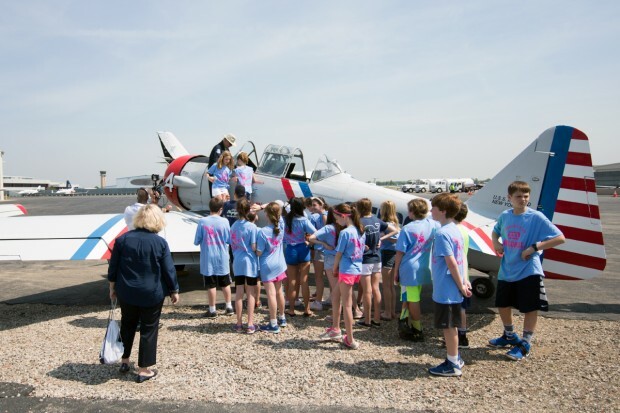 These trips are a great opportunity for young students to discover aviation and learn about the show and its performers. On this Thursday morning, students from the Woodhull Intermediate School Student Government were given the chance to go up close with the famous GEICO Skytypers and their vintage WWII aircraft. 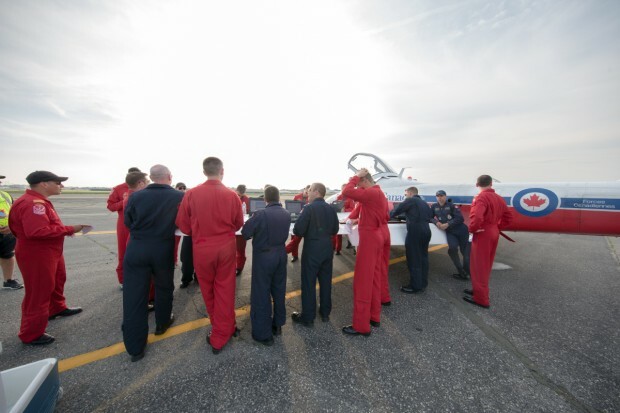 Thursday evening saw the arrival of The Royal Canadian Air Force Snowbirds, an eleven jet demonstration team flying the CT-114 Tutor. After landing, the crew debriefs and goes into detail about the weekend’s itinerary. During their stay at Republic, one of their jets encountered a rock ingestion into its engine, and maintenance crews performed an engine swap on the spot. The Royal Canadian Air Force Snowbirds debrief after flying their jets into Republic Airport. 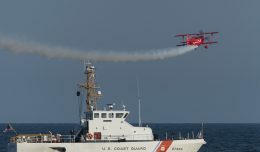 Saturday was airshow day number one, and it did not disappoint. NYCAviaiton flew along with The U.S. Army Golden Knights to see what it’s like to jump out of an airplane in front of thousands of people. The Golden knights fly a Fokker C-31A Troopship, one of only a handful of Fokker aircraft flying in North America. With both doors open, air rushed through the aircraft at over 50 MPH. 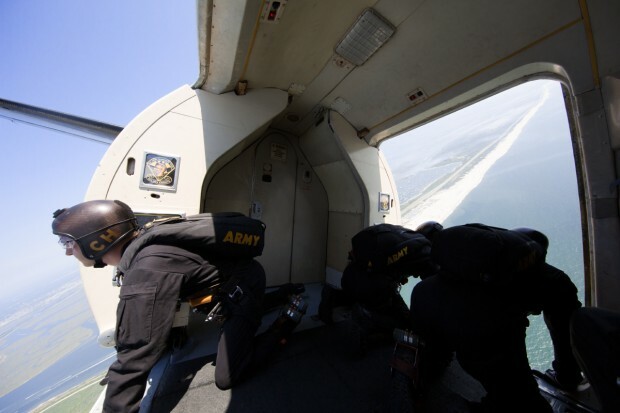 As our aircraft climbed up to 12,500 feet over the Long Island South shore, members of the team pointed out the performers ten thousand feet below us. The best perk of flying in the airshow? You get to beat the traffic! Stay tuned for our in depth story about that experience.